Eleven days since the last post? Seriously? I’ve been mostly out of town for the last week, but that doesn’t mean nothing’s been going on since I put together that bed (which is still as plain-jane-pine-bed as could be, but I have a plan!). Last weekend I went to visit Eva on her home turf in New Jersey and we went to a couple flea markets. 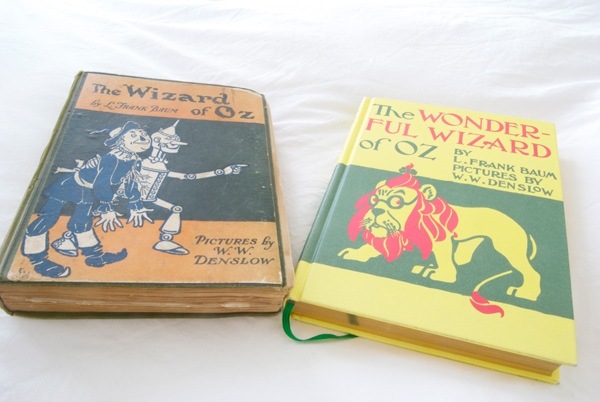 We didn’t find anything big like furniture, but Eva did spot a very old copy of L. Frank Baum’s The Wizard of Oz. I’ve always loved Oz— like most people, the 1939 film was an enormous part of my childhood. When I was little, I liberated my dad’s 50s edition of the book from my grandparent’s house, but it wasn’t until this year that I actually read the original text in its entirety for a research paper. 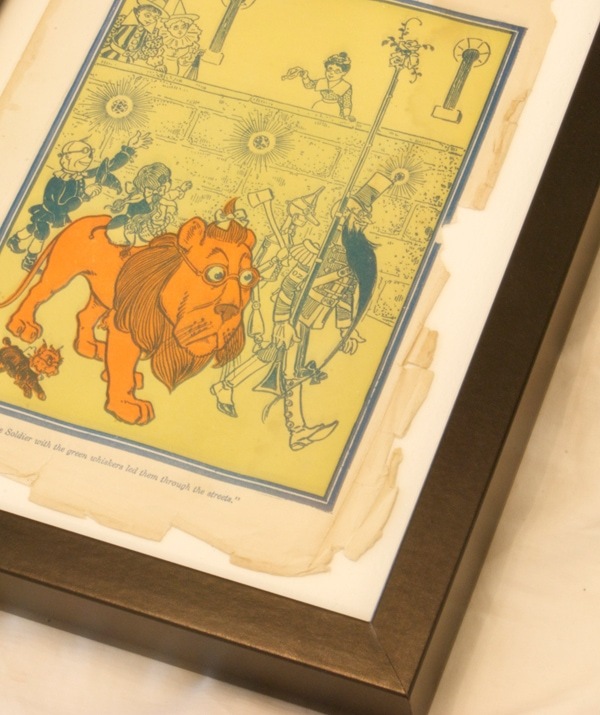 At the time I bought the HarperCollins 100 year anniversary edition of Oz, which has all the original W.W. Denslow illustrations in full color– and they’re beautiful! And at $17, it’s crazy cheap for such a beautiful book with color on every single one of the 261 pages. 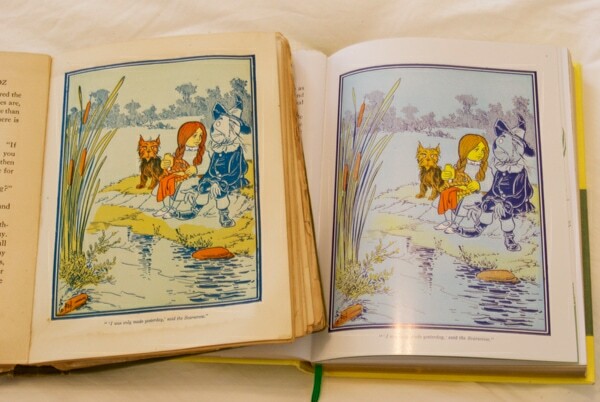 Even though it’s copyright 1903 (the original copyright is 1900), it was actually printed in the 1930s with 8 of the original 24 full-page illustrations in full color. And even though I like the extremely bright colors of my new edition, I really love the richer colors of these 80 year old pages. The old book isn’t really in the best shape (probably why it was only $30, but I still think it’s likely worth much more), which was sort of perfect. 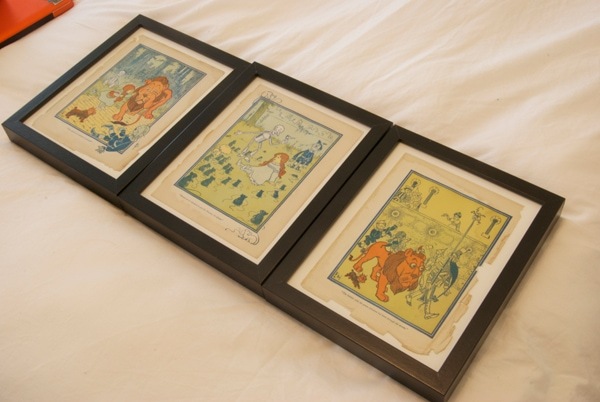 Three of the illustrations had already come loose and were tucked inside the book, so they were basically asking to be framed. I wouldn’t frame something like this just because I like the book, but I think these drawings are so cool because they have these awesome pop colors that seem totally incongruous with the time period they came out of. And I love Oz. That too. I decided to back them with some plain off-white stationary paper I already had, which has a nicer texture than a regular piece of printer paper. And I like the look of the rough edges, so no matting here. I got extra lucky that the three illustrations that happened to be detached were also some of my favorites of the book! When Dorothy, the Scarecrow, Toto, and the Tin Woodsman first meet the Cowardly Lion; when the travelers first enlist the help of the mice (a great scene that’s never been adapted in any of the film iterations– they save the Lion from the poppies! How cool is that? ); and when they first enter the Emerald City. I don’t really have a place picked out for them yet– much like 90% of the other art that’s sitting in a pile waiting for the right wall space– but I’m excited about them. And at $45 for the entire project, including $15 for the three RIBBA frames from IKEA, it’s already worth it. Great idea to frame them, but is the stationary acid free? If not, get some acid free cardstock from Michael’s or Staples to avoid further damage to the paper.